Working closely with young professionals in metropolitan areas, I created an alternative grocery shopping experience designed to compliment their fast-paced city lifestyle. Sole is a boutique grocery experience catered towards young, busy singles in cities. Designed to combat the issues normal metropolitan grocery stores have, all food items are sold only in pre-portioned "Whole" "Half" or "Quarter" serving sizes. This packaging solution allows customers to shop based off recipes– only buying, and having to carry, exactly what they need. Through conducting a series of interviews with people living in metropolitan areas, as well as researching common shopping alternatives such as Blue Apron (an ingredient delivery service), or FreshDirect (a grocery delivery service) I was able to determine a pattern of issues regarding nutrition, cooking, and grocery shopping in the city: weight, planning, time and expenses. The solution needed to be high quality, convenient, light, and minimize planning and prep-work as much as possible. To further simplify this shopping experience, Sole offers its own extensive recipe database where ingredients are converted to W, H, or Q portions. 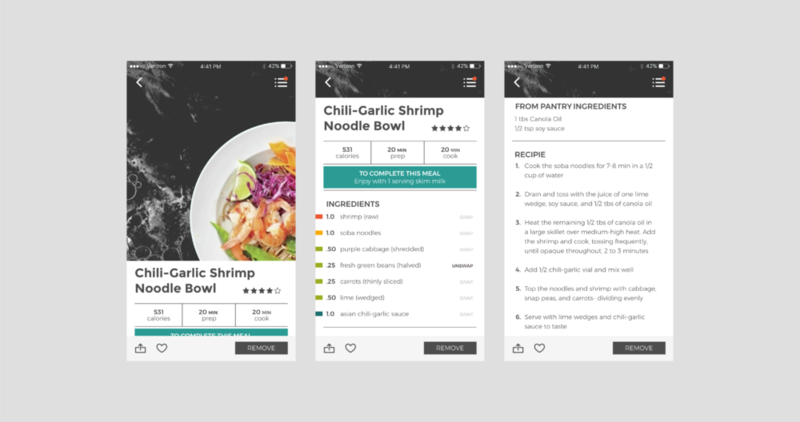 Customers can access these recipes at the touch screens all stores are equipped with, or download the app for further dietary customization options. Customers also have the option to order meals ahead of time so the ingredients are pre-packed and waiting for them when they arrive- think of it as Blue Apron on demand. By pre-preparing ingredients, the Sole experience opens the doors to a whole new realm of simplified cooking. Users can search by a recipe name, ingredients used, favorites, and cuisine styles. 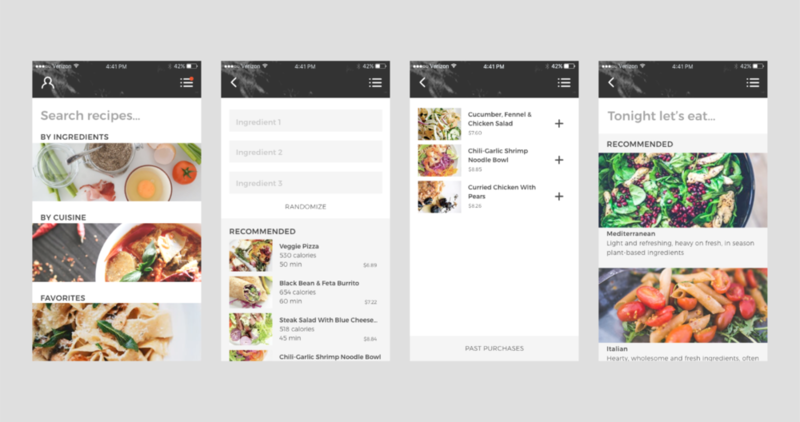 Downloading the personal app also allows users to modify recipes and filter by their dietary preferences. Continuing the trend from the app, products are packaged according to food group. To speak to the "boutique" experience, I created patterns out of scanned images on foods within each group for a more elegant and dynamic labeling solution. A clean division between clear plastic and waxed papers protects food while remaining single-stream recyclable, and labels have a break down of the food group to accommodate allergy and dietary preferences.